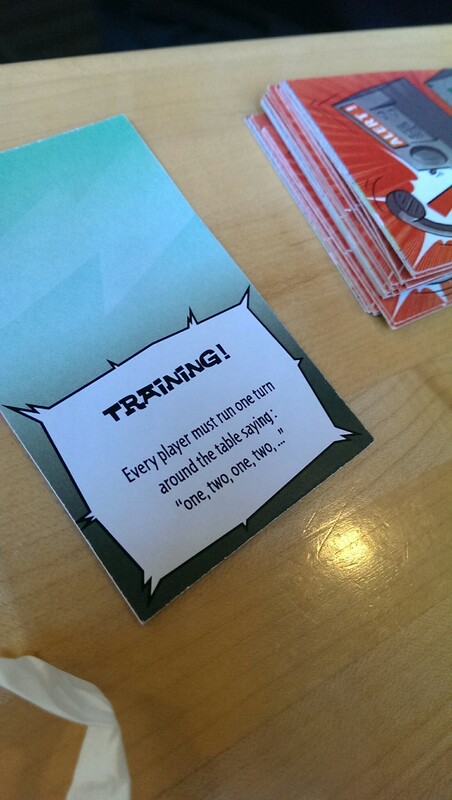 Note: I believe this game is scheduled for release at Essen, but I cannot at this time confirm or deny this 100%. I’m so panicked I took the photo upside down! Ever wondered what it would be like to be a doctor in the room during emergency surgery? Yeah, me neither. 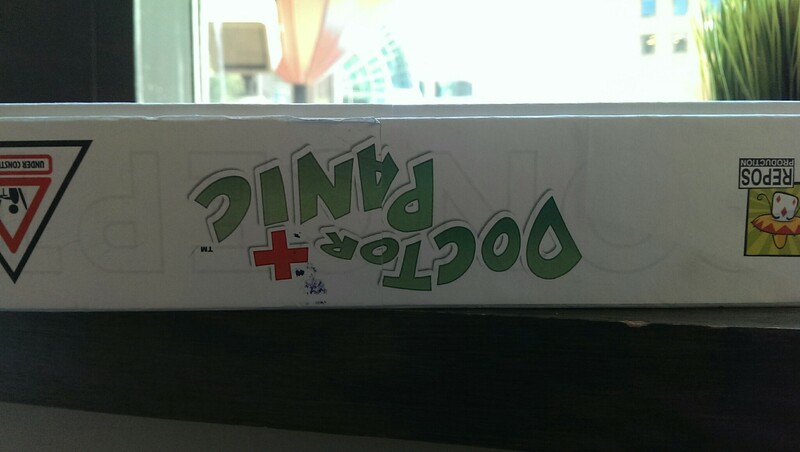 But that doesn’t mean you shouldn’t check out Doctor Panic, a new real-time cooperative party-ish game coming from Repos Production/Asmodee. Doctor Panic is possibly the wildest, most frantic real-time game I have ever seen. Here’s a breakdown: you and your players are a team of surgeons trying to save a patient in criticial condition. So you’ve got diagnose the patient, collect his/her information, get the right medicine, take an X-Ray, and sew everything up. All with a timer counting down and the occasional emergency event to deal with. In specific game terms, there are 8 different challenges, and each game you’ll take on one of each. Each challenge is represented by a card, and involves a goofy little mini-game you have to resolve. With a timer counting down, putting on the pressure. Look at all these parts! In one challenge, one player has to get another player to stand in a specific pose, but they can’t show the image on the card, they can only describe it. In another, a player has to ask for specific tools which the others must find as quickly as possible in a deck of cards. 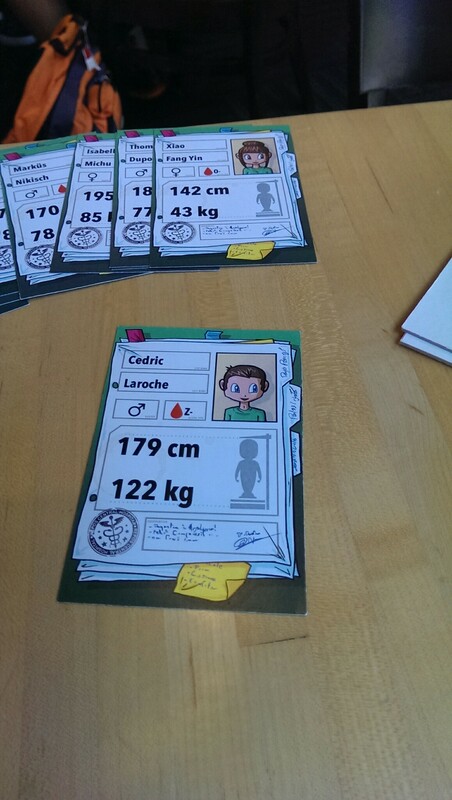 In another, you have to look at the patient information to determine how much medicine to put in the syringe, and then find the right cards that add up to the number. One challenge has you placing patches on the patient’s body in the right place, but again one player has to describe where they go based on the card, while the others try to get it right. One challenge has players threading a needle through various colored holes using tweezers to hold the needle, according to the card-reader’s instructions. Oh, and while this is happening, emergencies will pop up that you have to ‘deal’ with. Look, someone cut an artery and the patient is bleeding out! Everyone has to put a finger on the table (you know, to stop the blood) while they complete the next challenge. There’s even a cushion to use for compressions when you need to do CPR. It’s a family-friendly game; all the images are cartoony, and there is no blood depicted and no gore. While some of the challenges are trying to represent real actions (like that CPR cushion), it’s exaggerated for humor, and most of the things are just kinda goofy. Why do you need someone to stand on one leg with their arms stretched out for an X-Ray? You don’t. It’s just a silly party game. 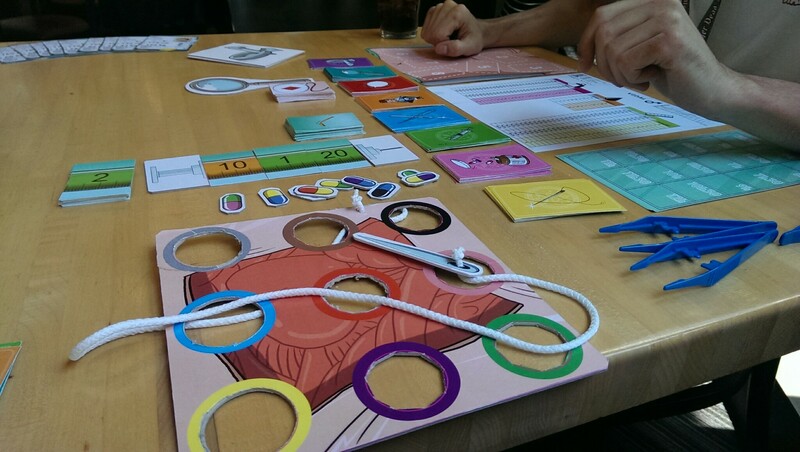 A silly, crazy, party game. Each mini-game is very simple, but with all the ridiculous going on you might risk getting a heart attack for real by playing it. I can’t wait to try this one out for real when it comes. I think it’s an Essen release. Never heard of this game before, looks and sounds awesome. Nice to see the metric system utilised too! It’s pretty new, the version we played was still a prototype. Also many of the elements were from the french version, and I can’t guarantee if it’ll still be metric in the english version of the game..